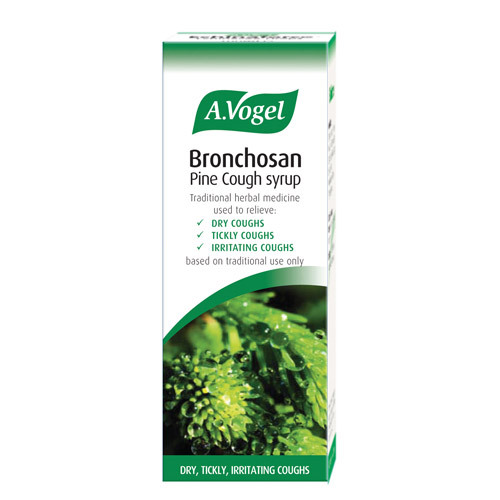 A Vogel Bronchosan Pine Cough Syrup is a traditional herbal medicinal product used for the relief of coughs, such as dry, tickly and irritating coughs, exclusively based upon long-standing use as a traditional remedy. Bronchosan is one of Alfred Vogel’s oldest remedies. It is a cough syrup containing the extracts of freshly harvested pine (or spruce) shoots as well as honey. Young pine shoots, picked in spring when the needles are still green and soft, have been used for many decades as a traditional remedy for dry, tickly or irritating coughs. Cough syrups help to ease the irritation in the respiratory tract. They are sometimes required after a cold or flu, or following other infections of the respiratory tract. Conventional cough syrups may contain ingredients that may cause drowsiness – and this is the reason why some people prefer to use a cough syrup containing herbal or natural ingredients which are not associated with this concern. 5ml (6.95g) of the cough syrup contains 1.445g of extract (as soft extract) from fresh Picea abies (L.) Karsten (spruce) shoots (0.9-1.2:1.) Extraction solvent: water. The other ingredients used for the cough syrup are raw cane sugar, honey, concentrated pear juice and pine oil. Take 5-10ml (1-2 teaspoons) two to four times daily. A measuring cup is provided. Not for use in children under 12. Do not take this product if you are allergic to Spruce or if you are allergic to Pine species, colophony or any of the ingredients in this product. Do not take if you are pregnant or breast-feeding. This product is not suitable for diabetics or vegans. 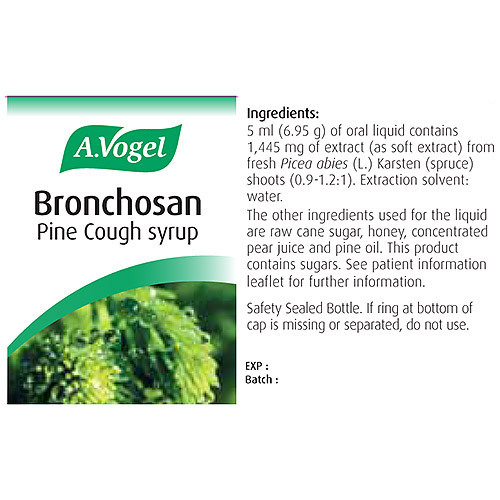 Below are reviews of A Vogel Bronchosan - Pine Cough Syrup - 100ml by bodykind customers. If you have tried this product we'd love to hear what you think so please leave a review. This is marvellous and I always go straight to it at first signs of a cough. This cough syrup is excellent. I always keep a bottle of Bronchosan in my cupboard so it is there when I need it. THIS IS THE ONLY SYRUP THAT CALMED DOWN COMPLETELY THE COUGH OF 2 OF MY FRIEND AFTER WEEKS OF COUGHING. IT IS MARVELLOUS !!! !